This comprehensively updated new edition provides a thorough and dynamically-illustrated overview of the female reproductive organs, care of the female during pregnancy, childbirth and the postnatal period. It is clinically relevant, with a focus on diagnosing, managing and treating disorders and abnormalities and is fully aligned with medical school curricula. The companion website at www.ataglanceseries.com/obgyn features interactive flashcards, case studies and multiple-choice questions (MCQs). Obstetrics and Gynecology at a Glance is the perfect guide for medical students, junior doctors and midwives, and is ideal for those embarking on clinical rotations and the clerkship. Errol Norwitz, Louis E. Phaneuf Professor of Obstetrics & Gynecology, Tufts University School of Medicine, Boston, USA. John Schorge, Clinical Director, Gillette Center for Women's Cancer, Massachusetts General Hospital, Boston, USA. 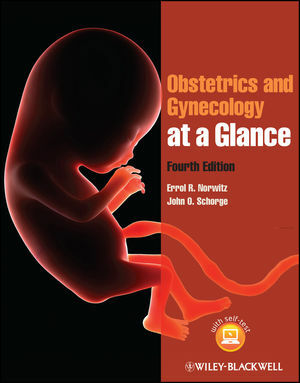 Obstetrics and Gynaecology at a Glance Companion website features MCQs, cases, and flashcards.